Previously, on MinerBumping... 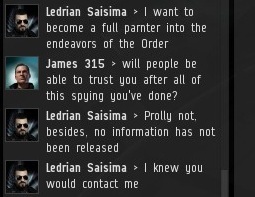 The New Order was shocked when Ledrian Saisima, who had given us 220 million isk, suddenly revealed that he was a spy. I contacted Ledrian and demanded an explanation. Ledrian informed me that he had been on a one-man infiltration mission the whole time, gathering valuable intel on us. I asked him what the intel could possibly be. 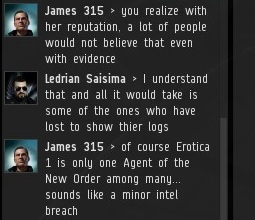 Ledrian claimed to have documents supporting his explosive claim that respected Jita isk-doubler Erotica 1 was actually a scammer. He conceded that his own intel-gathering was likely insufficient to bring down someone as highly-regarded as Erotica. But this was only the tip of the iceberg. ...Or it was the entire iceberg. Still, Ledrian was confident that he could cripple the New Order's isk-doubling backbone at a stroke. If he wanted to. However, during his time as a false Agent, Ledrian had come to realize that he had mixed feelings about the New Order. There was much he admired about it. This kind of thing often happens to spies on long-term assignments. Had his cover identity begun to bleed into his true personality? 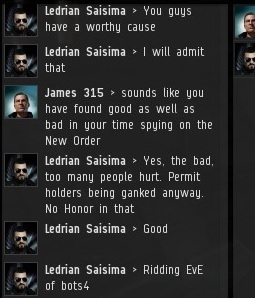 Ledrian's own hatred of the bots made him sympathetic to our cause. To that extent, at least, he wanted to help. Ledrian had gone from trusted shareholder of the New Order, to dangerous self-confessed spy, to aspiring partner of the New Order--all in a matter of minutes. He admitted that his minutes-old betrayal might hamper his efforts to build a relationship with the New Order. But Ledrian had big plans. I was eager to hear them. 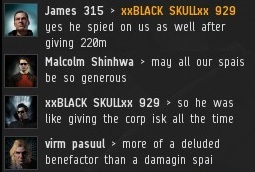 Meanwhile, at New Order HQ, Agent xxBLACK SKULLxx 929 dropped a bombshell: His corporation had been infiltrated by a saboteur who had given him 500 million isk and abruptly dropped corp. 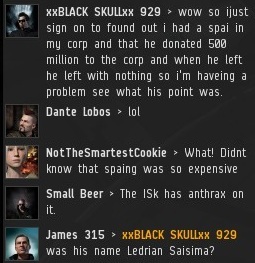 The corporation in question was Laughing Devils, a corp used by xxBLACK's alt and a few of his friends. 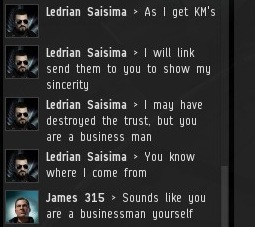 They had no idea what Ledrian was up to, aside from giving them isk. 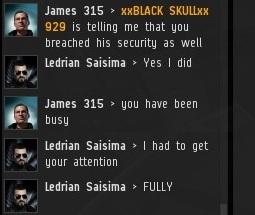 I confronted Ledrian with XXBLACK's accusation. He immediately confessed to having masterminded the infiltration/funding of Laughing Devils corp.
Now that Ledrian had established his credentials as a master spy, he could pitch his business idea to me. 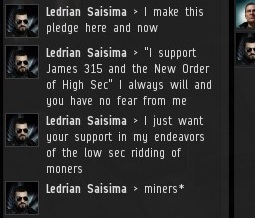 He explained that he intended to expand the New Order of Highsec by invading lowsec and attacking all the miners there. 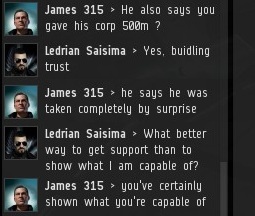 By presenting me with lowsec miner killmails, he would restore the trust that had been lost earlier that day when he had revealed his treachery. 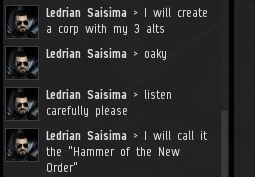 Ledrian would personally form the tip of the New Order spear in lowsec, while I would continue to manage affairs in highsec. Back at New Order HQ, our Agents received the news with puzzlement. They were still trying to untangle the mystery behind Ledrian's spying on the New Order and Laughing Devils corp. We bumpers and gankers are warriors. We're used to open combat and honourable PvP, so all of this cloak-and-dagger stuff was confusing. But as I was about to discover, when it comes to the dark arts of espionage, there's always another layer of secrets and lies hidden underneath. Goddamnit this is sad. Not too long ago I made a catalyst alt, trained up enough skills to blap, joined the New Order, and learned more about their operations than Ledrian did without revealing my main and without paying a cent. Of course, I was doing it because I wanted to shoot miners, not because I wanted to be a spai. Got bored though; sorry to drop out guys. Malcolm Shinhwa > that is a good plan. 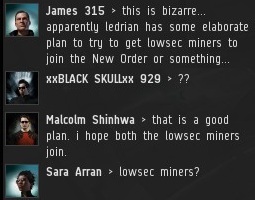 i hope both the lowsec miners join. Haha, all two of them. Malcolm stop stealing the show! This is serious bizness brah. 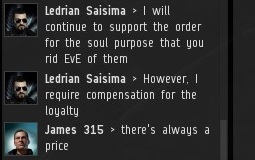 He has donated a lot of ISK. If he starts ganking AFK miners, all the better. The Code calls to anyone with the slightest amount of intelligence. If he has two braincells to rub together, he will stop beclowning himself with this spai nonsense, and get on board. I wonder if he could infilitrate Erotica's corp? I haven't seen her online lately... maybe she doesn't even know his name. The question is, how much isk would it take him to earn Erotica's trust? What if Ledrian IS Erotica? Ledrian appears to be very crafty. Note how he uses terrible grammar to fool his targets into thinking he is a complete retard. But all the while, he is gathering valuable intel. 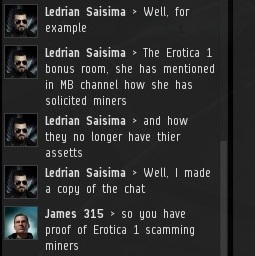 The question is, does he know the purpose of Erotica's corp? Who knows, maybe there are trillions of isk worth of secrets there. If they are, they are already dead before you arrive there anyway.